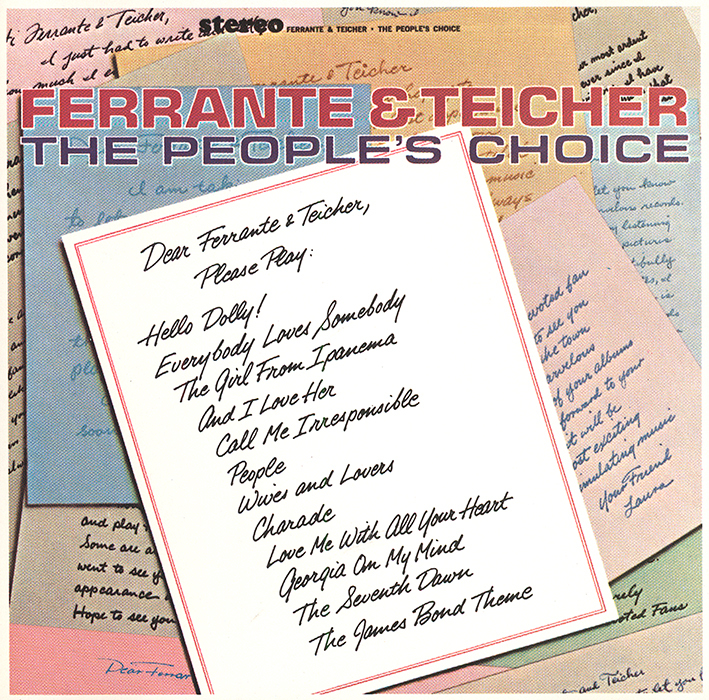 This album by FERRANTE AND TEICHER is indeed THE PEOPLE’S CHOICE. Actually, Arthur Ferrante and Lou Teicher have hit upon the simplest of formulas to delight and enthrall their many, many fans. They have carefully culled through their fan mail and also carefully jotted down the numerous requests made of them during their recent highly successful personal appearance tours. They then edited this long list to include only the great songs of recent vintage, the new standards such as “Hello Dolly!,” “Call Me Irresponsible,” “The Girl From Ipanema,” and “Wives And Lovers.” Working hand in hand with Producer Leroy Holmes, Ferrante and Teicher meticulously planned the arrangements and then labored long and hard at the recording sessions. The results speak for themselves! Here are a dozen wonderful fresh, yet familiar, songs, done in typical F&T style – that is, lush, string-filled, dream and so very listenable. Here then is THE PEOPLE’S CHOICE from FERRANTE AND TEICHER, one of the most enjoyable collections ever and certainly one of the most aptly named…. Like many of the 1980s Liberty reissues, this album was available on Lp and cassette in an abridged format. They omitted "Love Me With All Your Heart" and "The Seventh Dawn." Fortunately, the compact disc was reissued intact.